This is not so much a review of the movie The Grudge as it’s about a topic sparked by its theme. So The Grudge is a movie from 2004, based on a Japanese horror film of the same name (called “Ju-On” from 2002). I forget exactly when I first saw it, probably a year or two after, as I did not watch it in a theater, and I’m thoroughly glad I didn’t. Granted, this image is from the Grudge 2, but you get the idea. Most of the images online are a bit too gruesome than I’d prefer to have posted here. The Grudge follows a number of tropes in common with the ever-popular title “The Ring” also from 2002 (“Ringu,” 1998, in Japan). In this humble writer’s opinion, the American versions are significantly scarier, as they retain the psychological horror aspect as found in the original Japanese versions, but with the added American flavor of jump-scare emphasis. If you haven’t heard of any of these pieces, or are largely unfamiliar with the J-Horror genre of psychological horror movies, I don’t know how to prepare you better than to say: Beware. For many people around the world, this kind of stuff is really bloody frightening. The common theme among nearly all of these sorts of movies – not only J-Horror, but K-Horror (Korean) as well, and throughout a much of East and South-East Asian cinema, is a paranormal manifestation the likes of which probably everyone in the world would recognize on sight. I’m talking about what the Japanese call a yūrei, what the Koreans call a gwisin, what the Vietnamese call a ma. You know, ghosts. And, just like the word “ghost” in English can mean a number of things, these are all generic categories. What I’m talking about, though, is a specific type. And yet, oddly beautiful. Or am I just a freak? They’re quite iconic, and almost never pleasant. They’re most commonly spirits of dead folks who have been wronged, and are generally hateful of anyone or anything that interacts with them, or the places/objects they haunt. This, at least, is the common thread linking the majority of these films, and some of us can’t get enough of it. I went through a phase once, a couple years back, where I watched I watched a Korean ghost movie almost every night – at least once every couple of days – over the course of a few months. This resulted in my seeing shadows in the corners of my eyes during the day for many months after the fact. Oh yes, those were good times, working in a health food store only to whip your head around to make sure there wasn’t some pale, bloody phantasm creepily herky-jerky-ing its way down the vitamin aisle. Most of the time it’s been nothing. But there were some horrendous nightmares that come every now and then. Heck, I still get them sometimes – things I’d actually prefer not to describe at present – so yeah, on that note, let’s talk about why this stuff is awesome. For one thing, I’ve actually grown braver about a multitude of things. Or perhaps a little desensitized – is there a difference? Certainly, the line between bravery and stupidity is notoriously thin, but then again so is the line between confidence and actual ability. At any rate, the point is that I’ve been able to explore topics and media that in the past I might have otherwise been averse to exploring. Fear is something that interests me, and not only with the Long-Haired Ghosts, but other creepy things, but with other things creepy and terrifying. As I’ve said once or twice before, things that are creepy are scary. Just ask H.R. Giger. Man, do I love linking that VSauce video. 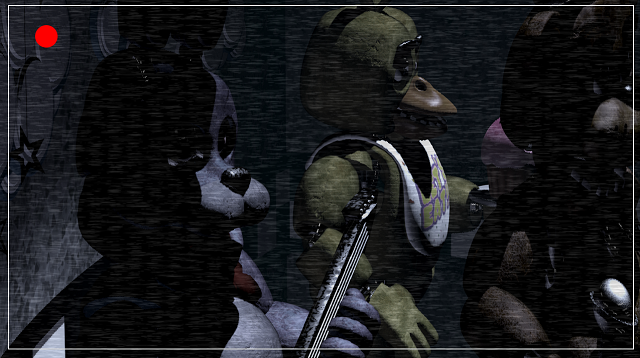 Five Night’s At Freddy’s, one of the most horrifying games I’ve ever seen. As of this post it’s pretty new, too, check it out. This has, in fact, benefited my writing as well as my outlook on life. The Long-Haired Ghost is something I’ve found to be repulsive and inspiring. While not directly appearing in my fiction, it has, like I said, allowed me to discover other things – and write about other things – that one might normally find difficult to entertain, or write. On the other hand, situations, creatures, or scenes that might be considered horrific by many are fairly normal to me. Re: desensitization/bravery. I feel that as a writer, this valuable. Besides, seeing The Grudge for the second time did raise the hairs on my arms and back of my neck, but it wasn’t quite as scary. My guest freaked out readily enough, though, so mission accomplished. The soundtrack is actually, in this humble writer’s opinion, much more delightful than the movie itself, though I’ll never forget the initial emotions evoked by my first viewing. Truth is, my mind paints a slightly different picture whenever I hear this music, and the picture in my head is better than the picture on film. Be that as it may, check out the soundtrack, if not the movie, and see what ideas appear upon the paper before you.